11 of our favorite State & County Fairs in America! Is there anything more American than the County Fair? The only possible answer is a State Fair. But what makes these fairs so beloved to Americans? Is it the display of community? The chance to enjoy rides in a family atmosphere? The contests? The fried food? The answer probably depends on the American in question, but we can all agree that the more on offer, the better. No fair offers quite as much as the State Fair of Texas. In a state where everything is bigger, it shouldn't come as a surprise that the state fair is the largest in the country. Featuring delicious food from all across the Lone Star State, livestock competitions, sky tram rides and Big Tex, a 55 foot tall talking animatronic cowboy, it should be no surprise that over three million people attended the 2014 fair. The Alaska State Fair might be a little out of the way for people in the lower 48, but making it north of Anchorage is certainly worth it. The fairgrounds offer year round events, but going during the Fair proper is the best way to experience some of the most impressive produce around. Picky eaters beware; humongous vegetables including heads of cabbage that weigh more than 100 pounds have won awards here. The California State Fair brings some West Coast flare to the fair scene. High-end shopping and dining are available along with your traditional fried dough and handicrafts. 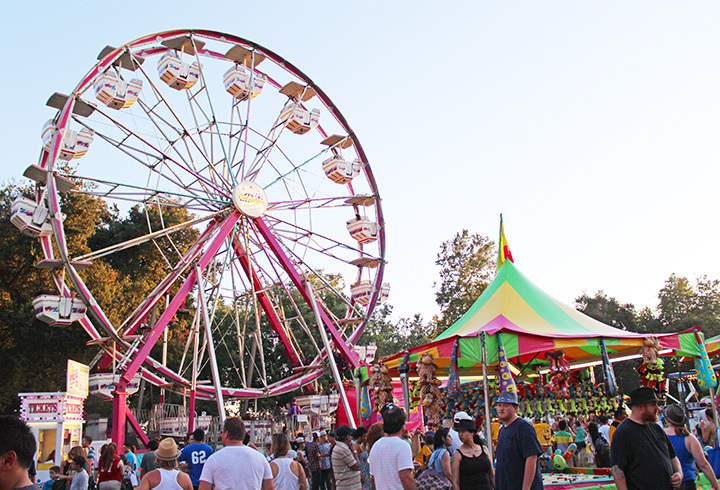 Located near the state's capital Sacramento, the California State Fair is conveniently placed near the Napa Valley which means tastings for locally produced world class wines and beers are to be expected. Fairs aren't just for big agricultural states. Rhode Island may not have its own state fair, but the Washington County Fair is the biggest in the Ocean State and offers everything fans of traditional fairs are after, and even more. Over 130 Non-profit organizations provide the fair's concessions, many of them offering up scrumptious local seafood. Another nautical highlight is the Battle of the Fishermen, which includes oyster shucking and dock-line throwing. The Clark County Fair in Washington State has all of the traditional trappings of your standard county fair, with almost 300,000 people enjoying rides, food, prize-winning produce and livestock, and getting involved in the election of a Fair Court. But it also hosts FairCon, a convention-within-a-fair featuring video games, comics, and trading card games. If you're a proud nerd this is the Fair for you. Other states may produce more dairy products overall than Iowa, but nobody produces as much art with their butter. One of the headline attractions of the Iowa State Fair is the Butter Cow, a life size reproduction of a real cow made out of over 600 pounds of butter. And if that's not enough to melt your heart, an entire gallery of butter sculpture is on display for you to enjoy while eating the fair's signature sandwiches on a stick. The Eastern States Exposition, otherwise known as "The Big E" is the official Massachusetts State Fair and an unofficial second state fair for the rest of New England. With six states represented at the Big E there is a sense of competition you just don't see at other fairs which really drives all of the contests and activities. But there is still a sense of togetherness for this corner of the country; the Avenue of States has reproductions of each New England Statehouse that host museums about the history and industry of each state. Do you like creampuffs? Do you like wine? Do you like wine with your creampuffs? Than you need to visit the Wisconsin State Fair. Known far and wide for having creampuffs as the "official" food of the state fair, local wineries have also established a wine garden to show off the best wines that Wisconsin has to offer. Racing fans should also be sure to visit the Milwaukee Mile, the world's oldest continually operated racetrack. The Utah County Fair of Utah County, Utah has events aplenty for motorheads. Antique tractors aren't just put on display; there are antique and modern tractor pull competitions. Monster truck shows and demolition derbies round out the internal-combustion powered action. Don't worry if you like your adrenaline a little more old school though, in addition to a wide variety of rides there are horseback shooting competitions for the realest cowboys. The Kentucky State Fair has all of your expected State Fair indulgences. There's fried food and rides plenty of exhibits to showcase the state's pride in cultural and agricultural achievements. But it also has Health Horizons, a unique section of the fair dedicated to helping the people of Kentucky take control of their health. Free check-ups, pharmaceutical samples, blood donation banks, and medical displays all feature prominently. The Oklahoma State Fair has tons of entertainment options. Live music venues are scattered all around the fairgrounds but there are unique offerings too, like performances of Disney On Ice, and bull riding competitions. Besides all the food and rides though, there are extensive educational exhibits, including the Barnyard Birthing Center, where kids might get the chance to see the miracle of life unfold, or just some cute baby animals if they're not quite ready for that.